These charts show the average pellet count comparison between lead, steel, Rem HD (aka hevishot), and TSS (Tungsten Super Shot). Shotgun pellet counts range from 7/8 oz. all the way up to 1 3/4 oz. Pellet sizes range from 9 shot to T shot. Below is a chart showing Tungsten Super Shot (TSS) Pellet Counts compared to Lead, Hevishot, and Heavyweight shot. Federal TSS pellet counts are equivalent to the regular TSS loads. Shot sizes 2 through 9 are listed. These charts are meant to give a quick comparison of the amount of pellets in varying loads. Density ranges between 7 g/cc and 18 g/cc depending on the shot type. Below is a chart showing Bismuth pellet counts from 1/2 oz all the way up to 2-1/2 oz. Shot sizes 7 through BB are listed. 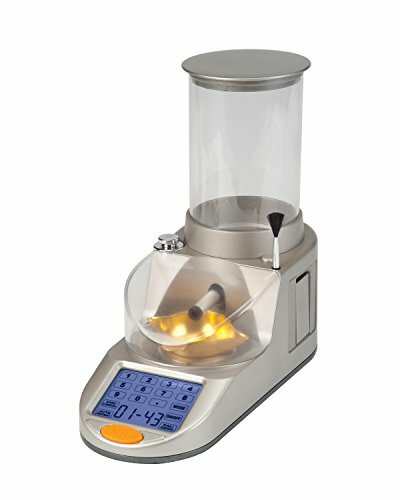 Need a new loading scale to weigh powder quickly and precisely? We recommend the Lyman Gen6 Digital Powder Measure. Steel is the lightest non-toxic material used to hunt waterfowl in the U.S. It has the lightest density at 7.8 grams per cubic centimeter (g/cc). The switch from lead shot to steel shot occurred in the late 1980’s and mandated that non-toxic shot be used to reduce the amount of waterfowl and other avian species that were ingesting lead shot and developing lead poisoning each year. Hevi-steel was a product that used steel fused with Hevishot alloy to produce a pellet that was close to 9 g/cc. Hevi-steel has since been diverted back to an all steel load. The product that took it’s place is now called Hevi-Metal. It’s a duplex load of Hevishot alloy pellets mixed with steel shot. Bismuth was the non-toxic shot that started it all. It first came out in the late 1990’s as an alternative to steel shot and quickly gained popularity. Bismuth is especially known for it’s ability to compress when choked, making it a soft pellet great for older model firearms (similar to Nice Shot). Remington HD soon followed Bismuth and developed their own steel shot alternative called Hevishot. This 12 g/cc pellet revolutionized waterfowling by increasing clean kill ranges and increasing pattern densities beyond what was achievable with steel and Bismuth. 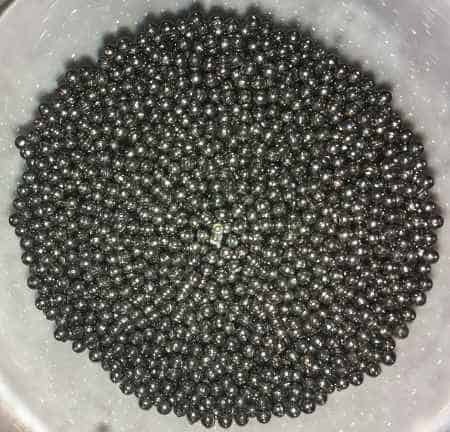 Hunters were able to drop down several pellet sizes from what they normally would use for steel, while gaining range, increasing pellets on target, and reducing wind drift. Remington Wingmaster HD was manufactured in bright green hulls that were prized by many in the reloading community. The 10 gauge 1 3/4 ounce load of Hevishot #2’s was found to be particularly effective for geese. Remington discontinued their Wingmaster lineup around 2008. Hevishot pellets are a mix of tungsten, nickel, and iron. 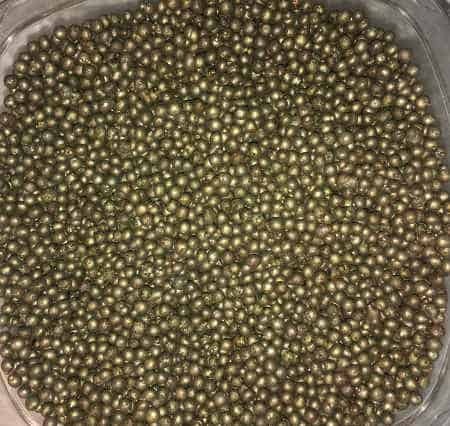 The process used to form Hevishot pellets results in pellets that are far from round and come in many different shapes and sizes. Some pellets can even have smaller pellets molded to them. These odd shapes create more drag through the air, but the density of 12 g/cc more than makes up for it. However, Winchester HD did produce a hevishot load that contained true round hevishot pellets at one time but has since been discontinued. Based on the hevi shot pellet count chart above, 125 #4 pellets are in an ounce of hevi shot. This pattern density makes 1 3/4 oz and 2 oz hevishot loads extremely effective. Federal was the first to offer a 15 g/cc pellet around 2010 called Heavyweight. The Heavyweight lineup featured both Waterfowl and Turkey loads. The waterfowl loads were available in both a 12 gauge, 3 inch, 1 1/4 oz and 12 gauge, 3 1/2 inch 1 3/8 oz boxes of 10. Both were rated at 1450fps. These loads proved to be even better than Hevishot and really tested the limits of long range waterfowl hunting. Even #4 shot was more than adequate for medium sized geese out to 70 yards. Federal also designed a Heavyweight load called Dead Coyote that contained a 1 1/2oz load of BB shot that received rave reviews from coyote hunters. Around 2006 a new non-toxic waterfowl load was being developed called Tungsten Super Shot or TSS. This 18 g/cc pellet was almost pure tungsten material and more dense than any waterfowl pellets that had previously been available. Initial testing was slowed considerably when scratching was noticed on the inside of the shotgun barrels. It was revealed that the tungsten pellets were leaving the wad prematurely and coming into contact with the barrel itself. Since the TSS pellets are more dense than the steel shotgun barrel, the pellets would leave these small scratches. These problems were rectified by switching to a thicker wad and adding overshot cards and Mylar wraps to prevent any pellets from escaping. Now that the load was developed, the true potential of TSS could be tested in the field. This took some getting used to since choosing the right TSS pellet size meant dropping down 7 to 9 steel shot sizes to reach the equivalent foot pound of energy at any given range. It’s generally accepted that TSS #7’s – #9.5’s are good pellet sizes for ducks, while #7’s-#5’s are the best for geese. Tungsten Super Shot is more spherical than Hevishot. It’s not perfectly round, as there are slight edges where the material has been cut, but individual pellets are similar in size and weight. Federal has just released their Black Cloud TSS loads for 2019. These loads are the first factory TSS available shells buy a well known manufacturer. They offer a duplex of larger steel shot on top of smaller TSS shot. One of the problems plaguing non-toxic shot is the price. It’s an unavoidable downfall that leaves many people focusing on steel shot only. Tungsten based loads can range from $30-50 a box of 10 manufactured shells. To combat this, tungsten re-loaders have focused on buying bulk TSS sourced from China and lightening their loads to 1 oz or smaller. Most tungsten based loads are only economically viable for waterfowl if they are being discontinued, on sale, or you reload your own shells while buying material in bulk.